We homeshooling Moms wear many hats. We often feel pressured to perform and wonder if we can truly do it all. Throw little ones into the mix, and our days can quickly become overwhelming. The Growing Homeschool can help! 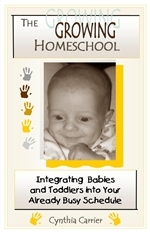 How do you homeschool older children and adequately nurture your little ones? Is it possible to keep a clean house, raise infants and toddlers, homeschool–and more? Can you successfully “do it all” and enjoy doing it? Juggling home management, family, ministry, often work-at-home, and your children’s education is a challenge. When you add infants and toddlers into the mix, things can get downright hectic. The Growing Homeschool can help you not only survive, but thrive! You will discover the difference between balance and integration, and how to leverage both for maximum effectiveness. Learn from an experienced, but in-the-trenches homeschool mom of eight how to prioritize, develop a workable routine, address the needs of different ages and stages of children, homeschool with greater ease, keep the little ones productively occupied during school time, and—most importantly—continually focus on the things that are of greatest value to God. The Growing Homeschool is a must-have for any homeschooling mom who is trying to successfully promote academic learning for older children and manage the hustle-and-bustle associated with younger children. Buy it for yourself, or give it as a welcome gift for a homeschool mom of little ones.